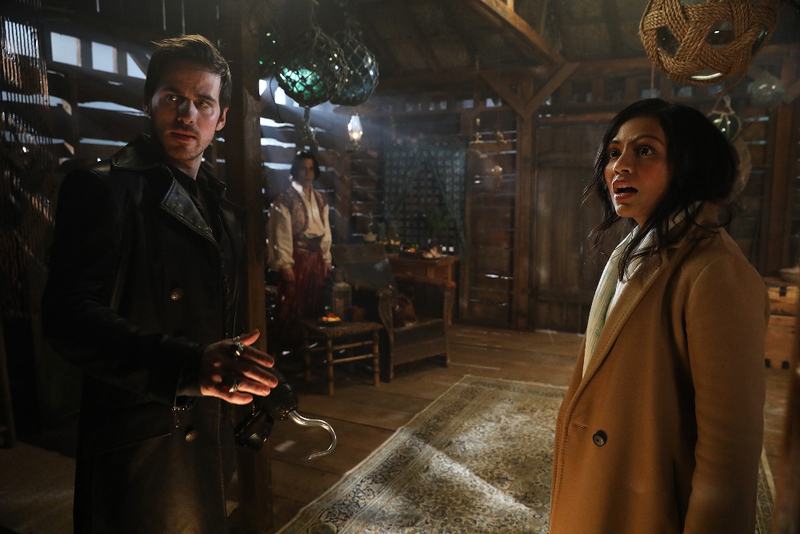 Preview images and ABC description for the Once Upon A Time episode "A Wondrous Place"
When Hook finds himself trapped in another realm along with the Nautilus and her crew, he races to return to Emma before Gideon can execute the rest of his plan. In Storybrooke, Regina and Snow take Emma out to get her mind off Hook’s disappearance. And in a flashback to Agrabah, Jasmine befriends Ariel, and together they set out to locate Prince Eric as the threat from Jafar intensifies, on “Once Upon a Time,” SUNDAY, APRIL 2 (8:00–9:00 p.m. EDT), on The ABC Television Network. Once Upon a Time stars Ginnifer Goodwin as Snow White/Mary Margaret, Jennifer Morrison as Emma Swan, Lana Parrilla as the Evil Queen/Regina, Josh Dallas as Prince Charming/David, Emilie de Ravin as Belle, Colin O’Donoghue as Hook, Jared S. Gilmore as Henry Mills, Rebecca Mader as the Wicked Witch/Zelena and Robert Carlyle as Rumplestiltskin/Mr. Gold. Guest starring are JoAnna Garcia Swisher as Ariel, Karen David as Princess Jasmine, Deniz Akdeniz as Aladdin, Oded Fehr as Jafar, Giles Matthey as Gideon, Faran Tahir as Captain Nemo, Gil McKinney as Prince Eric, Cedric De Souza as the Sultan, Nick Eversman as Liam, Zahf Paroo as Prince Achmed, Thomas Cadrot as Bartender, Shaun Omaid as Street Vendor and Jesse Stretch as Head Viking. “A Wondrous Place” was written by Jane Espenson & Jerome Schwartz and directed by Steve Pearlman.